Going way off topic this week, apparently scientist have discovered what may be a completely different species of insect from anything that has ever been seen before. Aethiocarenus burmanicus is unlike anything you (or science) has ever seen. 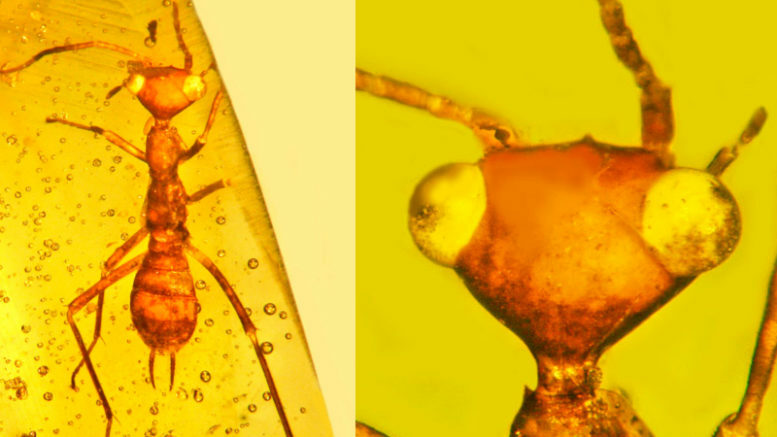 An exotic wingless female insect in mid-Cretaceous Myanmar amber is described as Aethiocarenus burmanicus sp. et gen. nov. in the order Aethiocarenodea ord. nov. and family Aethiocarenidae fam. nov. The distinguishing feature of Aethiocarenus burmanicus sp. et gen. nov. is its unique head, the dorsum of which is shaped like an isosceles right triangle with the hypotenuse at the top and vertex positioned at the base of the neck. While insects with triangular-shaped heads are common today, the hypotenuse of the triangle is always located at the base of the head and attached to the neck, with the vertex at the apex of the head. Other features of the fossil are the long narrow, flat body, long slender legs, especially the hind pair that are twice the length of the abdomen, lack of wings, protruding eyes, paired ocelli, secretory glands located on the dorsum of the neck and swollen abdomen bearing paired segmented cerci. In other words, it’s a bug. It’s an old bug. As in, about 100 million years old. It turns out the people who made Jurassic Park weren’t totally making stuff up… seems that you can actually trap insects in amber and they stay preserved for a very long time. It makes me think that we ought to start preserving things in amber. After all, imagine what the beings living on this planet 100 million years from now would think of an iPhone. I wonder if they’ll think it’s as ugly as I think this bug is?